We are entering the penultimate month of the year, during which the first uncertainties and questions that feed our thoughts about the approaching new year begin to emerge. 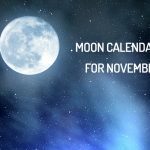 What is the influence of the lunar phases of this month of November on us? Here are the recommendations of the lunar calendar for November 2018. This phase of the lunar calendar for November 2018 is the ideal time to start some investments in the financial field. It’s also the right time to plan and achieve your goals because the chances of success are great. When it comes to health, this period is not indicated for surgeries and treatments, because the recovery period will last longer. However, this phase that will start on 07/11 at 07:08 am is ideal, if you want to start a beauty treatment and invest in clothes. When it comes to heart matters, for those who are in a serious relationship and have difficulties, it can be an opportunity for them to start again and renew their love. For singles, enjoy the New Moon to go out a little, meet new people. During the growing phase of the Moon that starts at 2:11 pm, you will gain energy. This will be the moment to defend all your projects with firmness and will. At this point, everything you undertake will have a great chance of success, your dedication and your willingness to develop new projects will reach its climax. This lunar phase is beneficial for overcoming obstacles, discovering opportunities and finding the best way forward. You must focus on your new ideas and get rid of those that are stagnant and without a future. Emotionally, you have to start a new story or take the first step to make an existing relationship serious. This period of the lunar calendar for November also requires that you enrich your curriculum and engage in continuing education. This phase is also ideal for starting long-term treatments. According to the forecasts of this phase of the lunar calendar for November 2018, it is not the moment to let your emotions guide you. This phase, which will begin on 23/11 at 05:40 am, is conducive to teamwork, good fruits will probably be harvested. But it’s important to note that this will only happen if you know how to manage your team. For your health, if you are planning a radical change, surgery or any other procedure in this area, you should probably wait. Let the Full Moon phase pass, because it is a very risky period. Enjoy the energy of the moon and strengthen your love life, whether you are single or in a relationship, what really matters is to use and abuse this moment of love. This lunar calendar phase of November 2018 will start at 00:00. It’s a great time to chase bad influences, bad habits, negative influences, to detoxify the body. This phase is also interesting to break with bad habits, lose weight. In terms of human activities, the waning moon is more favorable to material activities, relations involving duration. Introspection between November 29th and 30th will bring you answers to the important questions that you ask yourself because all the magical faculties will recharge, the power will be turned inward.